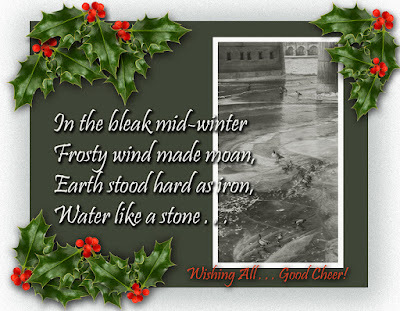 As this year draws to a conclusion, I've noted that it has been, in the tuneful words of Mr. Sinatra . . . "a very good year" with regard to sending forth, both to new collectors and long-time ones as well, quite a few works. I'm pleased that so many pieces have found new homes in the past 11 plus months and hope they will bring continued pleasure to their new owners for many years to come. 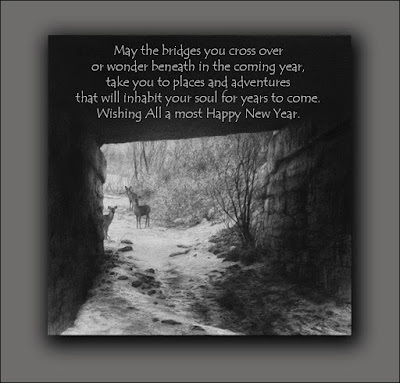 Onward now, to 2018. "Vermeer and the Masters of Genre Painting: Inspiration and Rivalry", is the title of a jaw-dropping exhibition currently on display at the National Gallery in Washington, DC. I met a couple of artist friends at the Gallery yesterday morning to share the experience of this wonderful assemblage of masterful art. 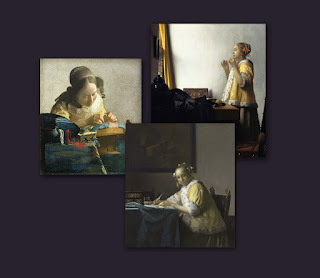 The underlying concept of the exhibition, which consists of about 70 works all together and features ten by the master, Vermeer himself, is to display works by him and a number of his contemporaries - all painting at the same time - to compare and contrast their individual approaches to the genre of portraying every day life. This is the kind of assemblage of art that, for an artist like myself, really touches the key issues of what it is to work among peers - learning from each other, bouncing ideas off one another, and feeding each other's needs to grow as an artist. Artists don't necessarily work within a vacuum, though we do tend to spend a great deal of time alone in our studios, alone with our own personal thoughts of how to work, what to focus on, and how to portray it. Having other working artists as friends and those to socialize with, enables we creative beings to 'talk shop', look over each other's shoulders and offer critique and advice when asked. 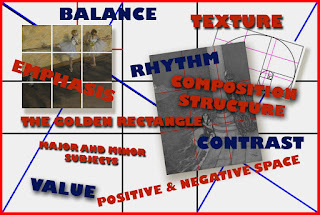 Seeing a large grouping of works, many of which portray similar if not duplicate ideas and compositional frameworks hanging side by side so comparisons can not only be seen directly but also understood in the broader context of a specific period of time, gives a more in-depth, richer appreciation of such bodies of work. As exceptional as many of his contemporary fellow Dutch countrymen artists were, once you see a Vermeer hung side by side with them, the immensity of his talents overbears. There is much to take away from this exhibition, which hangs through January 21st, and if you have time to enjoy the hour and a half video that is available on the Gallery web site, linked here, it will give a very fine overview of the idea behind this exceptional exhibition, or better still, if you can plan a visit to the National Gallery in the next month, you won't be disappointed. 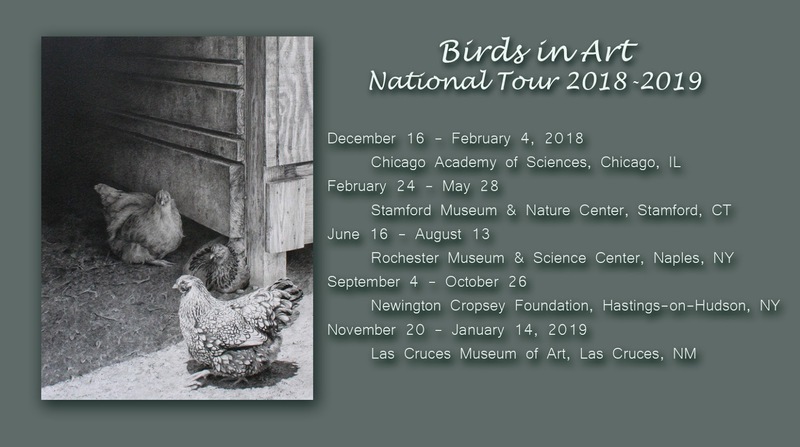 Shortly to open at the first of the five National Tour venues of the traveling portion of the 2017 edition of Birds in Art (which premiered as it always does at the Leigh Yawkey Woodson Art Museum), 60 works, including my "Lisa's Girls", will be on view in Chicago through the next several months. 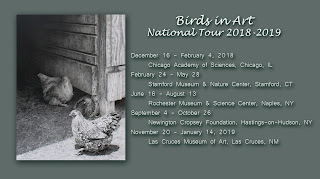 Check the list of venues to see if there is one near you and plan to see some marvelous works of art with birds as their common theme. 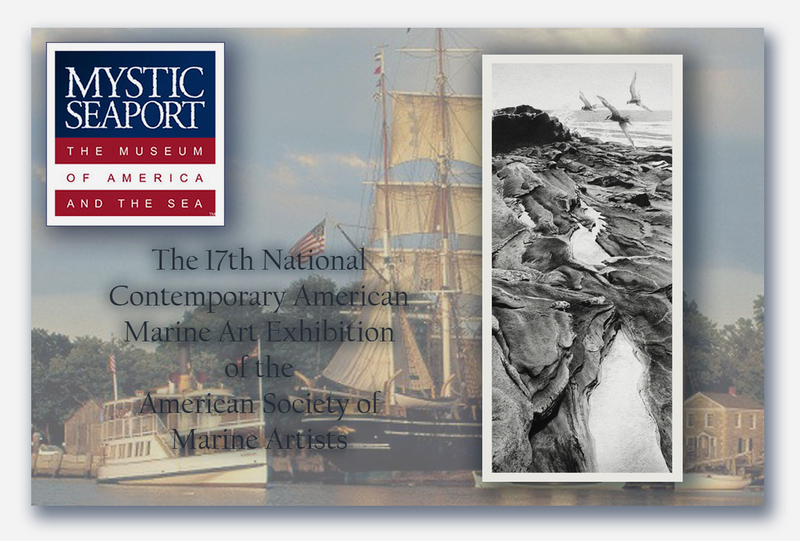 Currently hanging at the Mystic Seaport Museum, Contemporary American Marine Art - the 17th National Exhibition of the American Society of Marine Artists - will be on exhibit through January 21st. 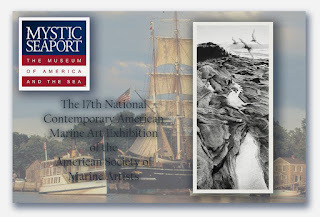 The Seaport Museum is the final stop of a six venue tour of the exhibition which originated in the fall of 2016, so if you are traveling to or near Mystic in the next two months, stop by the museum and take in this marvelous exhibition of 120 works, including my drawing, "To the Open Sea". Available now . 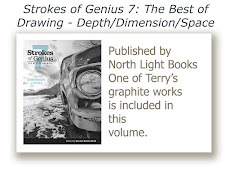 . . Volume 9 of North Light Books series, Strokes of Genius. 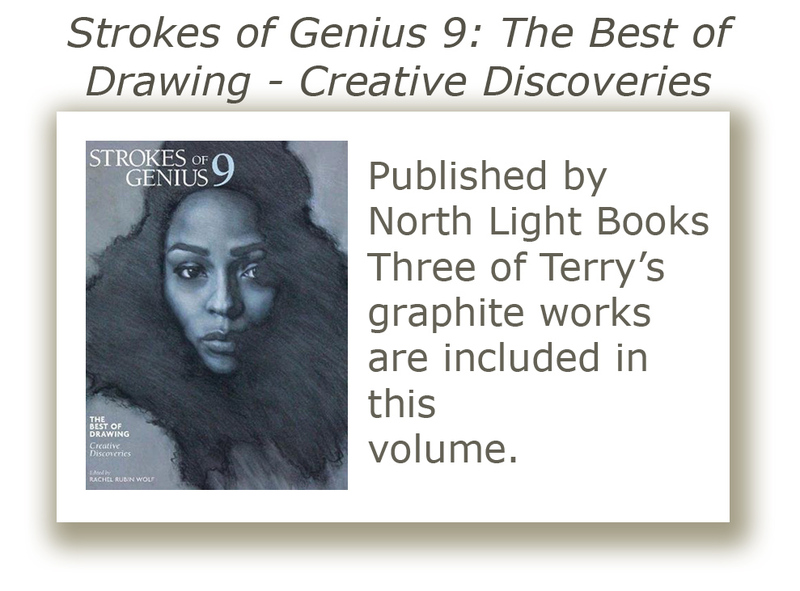 Got my copy recently and it is filled with inspiring works, including three of mine! 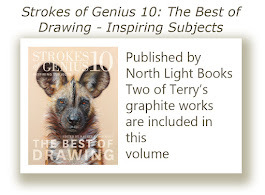 Would make a wonderful gift for a creative/arty family member or friend. 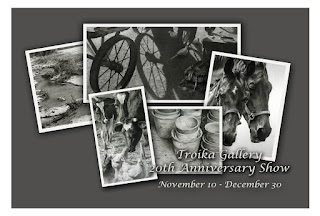 This coming Friday evening will mark the 20th Anniversary show at Troika Gallery in Easton, Maryland. 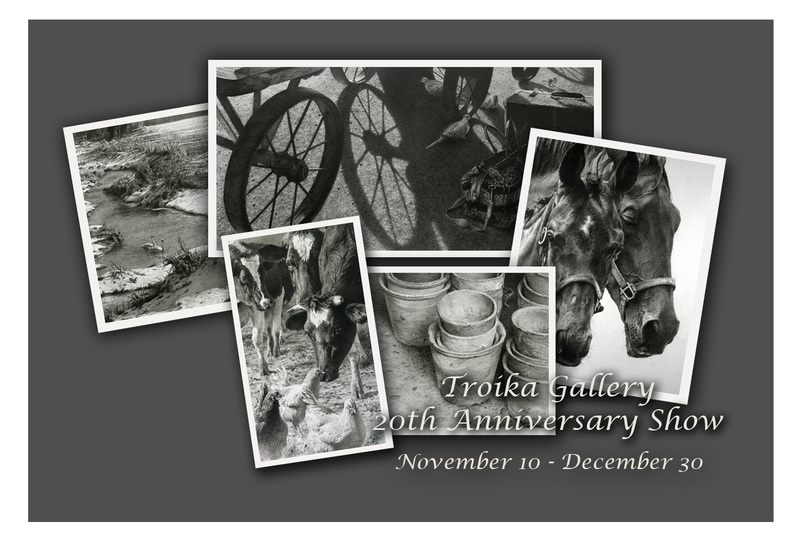 I'm pleased to have been associated with Troika for quite a few years now and will be on hand early in the evening to mingle and speak about my work. 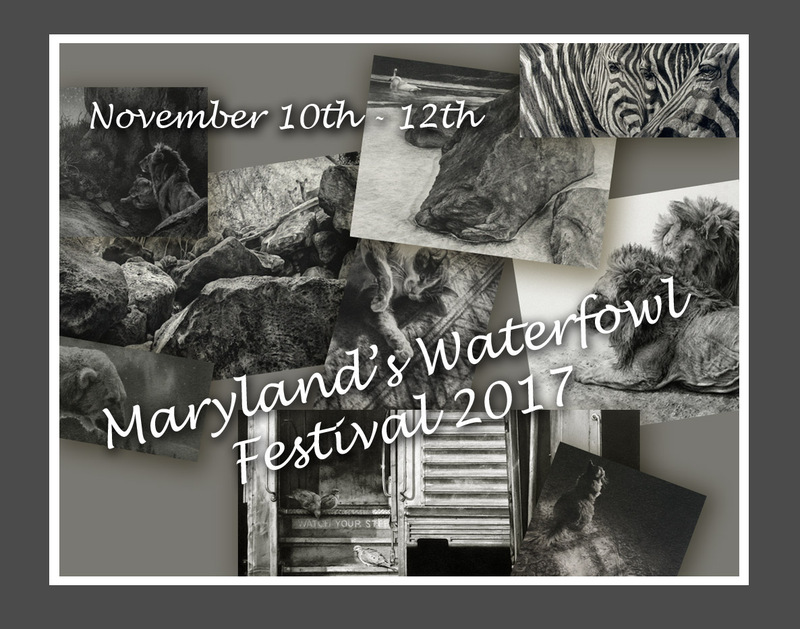 The show coincides with the first day of the 2017 Waterfowl Festival, at which I will also be exhibiting in the Armory. Come visit historic Easton and experience some fine art, sculpture, carving and craft during this year's Waterfowl Festival. 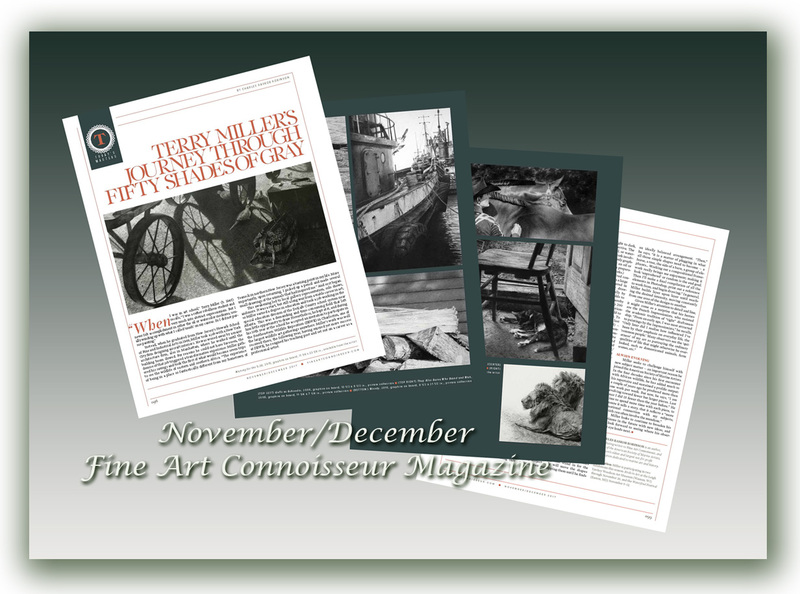 Following up on the last post here, also appearing in the pages of the November/December issue of Fine Art Connoisseur magazine, a very nice four page feature on me and my work. I am highly honored to have my work grace the pages of this respected publication and thank Peter Trippi and his staff for such a spotlight. The November/December issue of Fine Art Connoisseur magazine is about to go on sale. 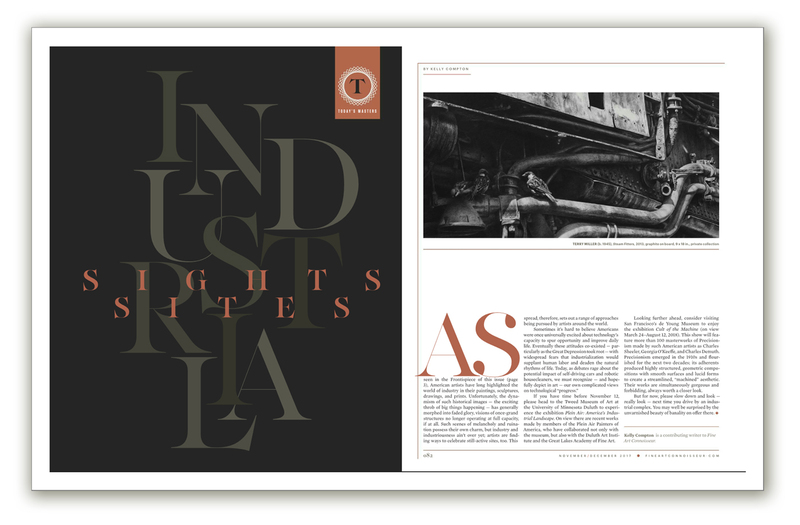 I'm honored to have one of my works, Steam Fitters, included in a special spread on Industrial imagery. My thanks to the editorial staff and Peter Trippi for spotlighting one of my works in this interesting feature. It's October 31st so you know what that means . . . 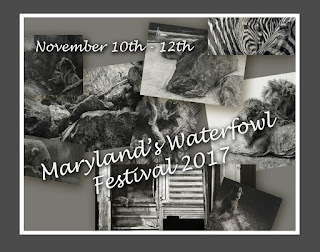 In a bit less than a month's time, the 47th edition of Maryland's Waterfowl Festival shall open. 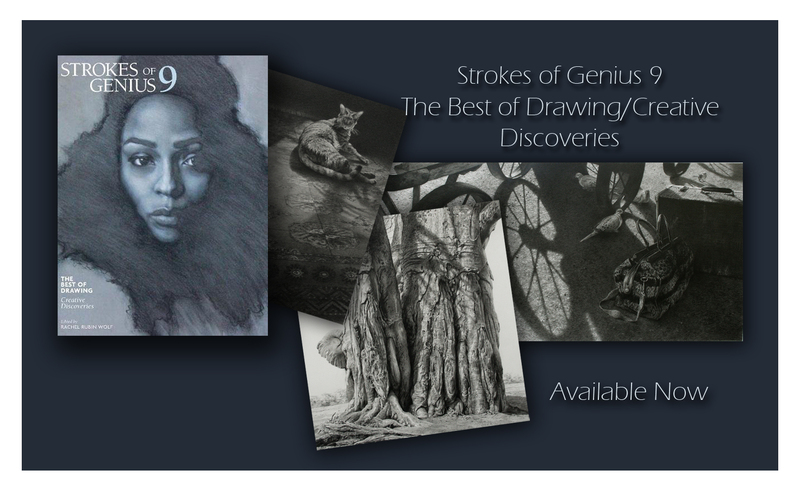 This year also marks my 26th appearance at the Festival and I'm busy finishing up creating new works to be shown during the art-filled weekend. Why not plan to spend a day in lovely and historic Easton, Maryland and enjoy browsing the art, sculpture, carving, and other activities and who knows, you may just bring home a new addition to your collection. 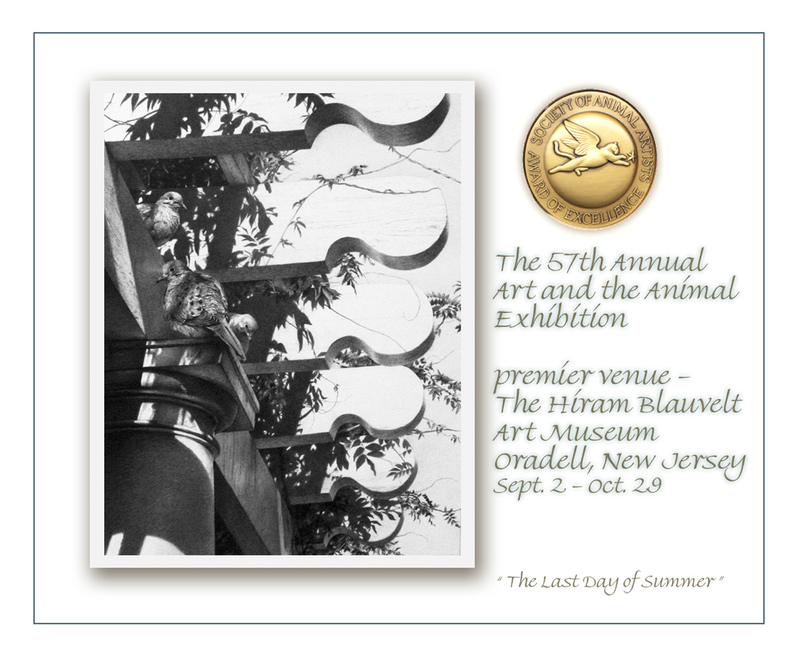 Having opened in early September, the 2017 members' exhibition of the Society of Animal Artists is currently on view at the Blauvelt in New Jersey and includes my work, "The Last Day of Summer". Next weekend is the members' reception, which I will be attending. The show hangs in northern New Jersey through the end of October and then half the works will go on a national tour. A week ago I returned from this year's opening festivities of the 2017 edition of Birds in Art at the Woodson Art Museum in north/central Wisconsin. 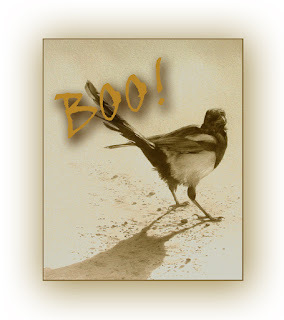 Those who have followed my blog page for any length of time know what that means . . . it's time for my occasional arm chair tour of some of my favorite works included in the exhibition. I missed last year as I was unable to attend the opening in person so am picking up where I left off two years ago. As I always note before digging into my ramblings about why I am about to spotlight a few of the 120 works included in the exhibition, I could easily speak about each and every one as every work chosen by this year's jurors had the spark, the grab, the power to separate a particular work from all the rest and make it stand out to the eyes of the three jurors, which, in the end, placed it into the final list of selected works. 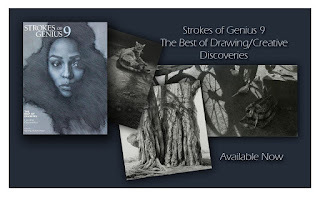 Space and time does not allow that sort of review, so here are 22 works that, to my eyes, epitomized the overall strength of this year's exhibition, followed by some thoughts on this year's honored Master Wildlife Artist, my friend, Don Rambadt. Grab a mug of coffee or tea or a glass of wine, if that time of day, and enjoy! The first two works, spotlighted below, were among my top five favorite works in the exhibition this year. 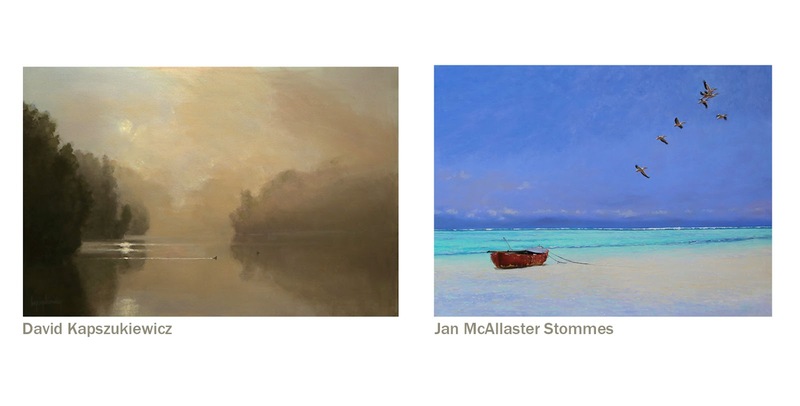 When initially flipping through the catalog in my hotel room prior to my first in-person visit to the museum, I was struck by the quality of the atmosphere depicted in both of these calming, inviting, lyrical landscapes. Local Wisconsin native, David Kapszukiewicz's A September Sunrise, caught my eye and brought my perusal of the catalog to a momentary halt as I was completely drawn into the misty morning-lit scene, and once totally involved, the discovery of his gracefully gliding water birds. Seeing the actual painting shortly after, reinforced my initial response to the work's sublime subtlety and all encompassing, believable creation of atmosphere. 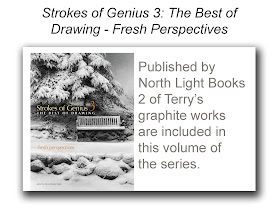 In general, when making my first quick study of all the works in the catalog, I try not to really take note of an artist's name, or review the size of the works as I like to find out those particulars later, and usually simply allow my eye to be focused upon each page's image and what that images says and how it speaks to me, the story that it may tell, or the words that come to mind upon seeing the image for the first time. In that way, perhaps, I try to mimic the way in which the jurors, tasked with making those all important selections, may approach their decision making as they too, do not know artist names when viewing all the entries in May each year. As a result of my leaning in the direction of making some judgement based solely on the images before me, I was pleasantly surprised and pretty much awed upon seeing Jan McAllaster Stommes' grand Caribbean scene, Moving On, at the museum - its 36" x 48" size taking my breath away momentarily. Again, Jan's work, with its iconic Caribbean blue sky and brilliant turquoise tinted sea created such an overwhelming feel of the vastness of that part of our watery planet, I had to stop and could almost smell the salt air and feel the pinching sting of the strong, Caribbean sun as I allowed myself to get lost in the immense space of her created oil. Few elements in her compositional design helped to aid in the feel of the vast space created in her sky, but the particular placement of each of those few elements (the group of flying pelicans and the lone beached boat) brought needed focus and well-thought-out balance to the overall mastery of her work. The creation of atmosphere to the point of making the viewer feel, smell, and sense the reality of the landscape being portrayed, can make for a work of art that will not only stop a casual viewer in their tracks, but also be the type of work that will, invariably, reach out and grab the eye of a prospective juror in an art competition as well. The next two works I've selected to spotlight represent any number of other works included in this year's exhibition for what I see as their enveloping exuberance. 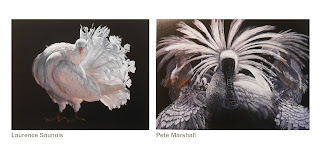 Native of France, Laurence Saunois, in her third inclusion in Birds in Art, dazzled my eye with Esperanto depicting a white peacock pigeon. Beyond the stark portrait-like nature of her oil painting, she was able to draw me into its frilly and fluttery feathering with a large smile upon my face as I took note of its more humorous qualities of gesture and pose. The dramatic lighting achieved and subtle variations in shades of white and pink and mauve against the intense black of the background, all combined to make Esperanto another in my top five favorites. English native, but current resident of Australia, Pete Marshall's Fantasia Royale, a colored pencil work, mirrored my reactions to Esperanto in that it too, brought a huge smile to my face as I stood before it in the museum. The same sorts of feathery flashiness that caught my eye in Saunois' pigeon, appealed again in Marshall's portrayal of her royal spoonbill in full mating plumage, though in a more abstracted format than in Saunois's hyper realism. Exuberance - something for any artist to consider when setting out to compose a new work of art. Artists should never be afraid of the word - small - when considering a new idea, and the next three works I've selected to feature prove that point. All three, the largest of which was only 17" x 11", commanded my attention equal to any of their companion larger works hanging in the galleries at the Woodson Art Museum. 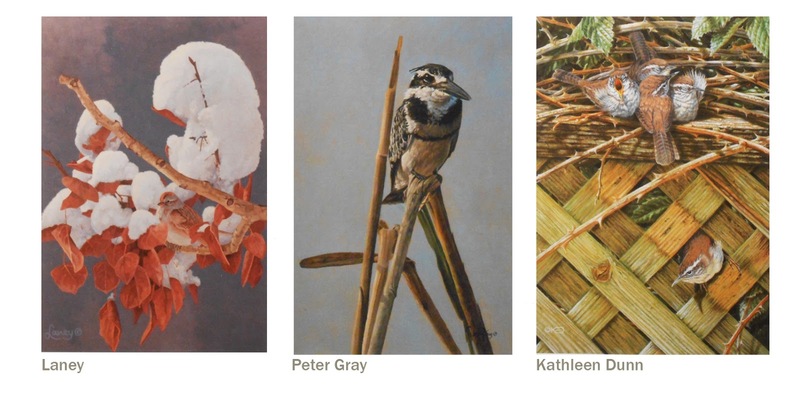 As well as depicting smaller stature bird species, each of these three paintings were created in a way that allowed their subjects to shine in distinct ways. Wyoming native, Laney, put her tree sparrow in a chilled yet inviting clump of snow-crusted leaves in Powder Snow. The coloring of the bird, matching almost perfectly the still clinging, fall-toned aspen leaves, made for a momentary exploration of finding the subject and then having that, "ah ha" moment of discovery, which always forces a smile on my face. I also loved her very spare palette of warm leaves against soft mauve tones for the negative space of the background. South African resident, Peter Gray's pied kingfisher, in Pro Fisherman, appealed to me in a similar manner to the way the more subtle, spare palette of Laney's work did. The strength of Gray's bird dominated the abstract construction of the reeds it rested on, allowing the cool blue-gray of the background to act as the perfect negative space to float his bird in front of. 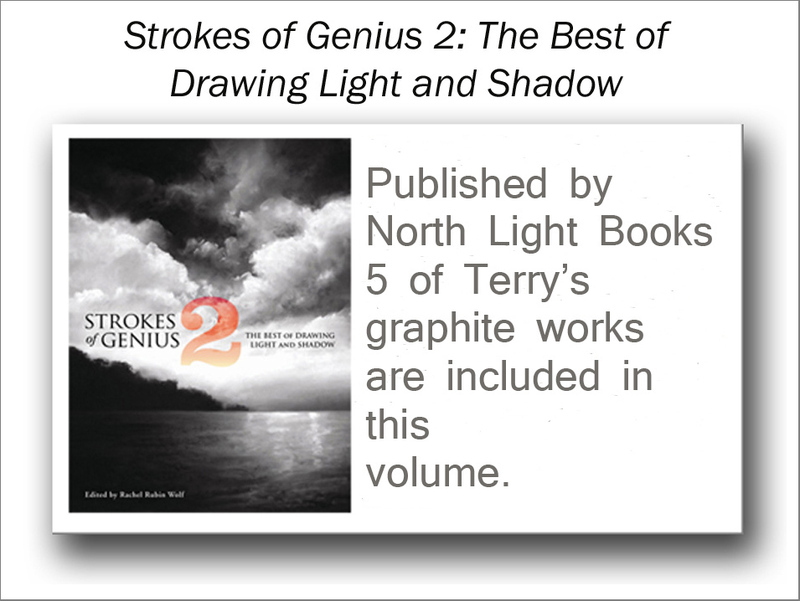 Though static in pose, as Gray noted in his text accompaniment to the catalog image as the bird contemplates his next hunt, there is life breathed into the composition through accurate modeling of the subject as well as a very fine use of light and shadow. In the last of this trio of small, intimate works, Kathleen Dunn, as noted in her accompanying text in the catalog, resolved, quite well to my eye, a problem that she noted struggling with over a three year period from drawing inception to completed painting. 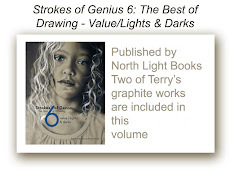 Of course, I knew none of that struggle upon first view of the work in the catalog and then later, in person at the museum, but was intrigued upon reading the catalog text later that evening upon returning to my hotel room. Basically, she noted having trouble finding an appropriate placement for a fifth wren, after having settled upon the grouping of the four in the upper center of the composition. I chuckled to myself as I read her account of trial and error of finding the right place to put that fifth bird as it is a struggle I often have found myself in the midst of when working out a new composition and could closely relate. Over and above all that backstory, my initial feeling of being drawn into her busy composition in The Explorers revolved solely around her well balanced composition and unique layering of curves and circles over strong angles, as well as the rather spare color palette which gave the work a very calming feel to my eye. At only 12 1/2" x 9", her oil easily cast a spell over me equal to the larger works that hung to either side of it in the galleries. And thus, small certainly need not be a deterrent to any artist in seeking to command attention, capture a juror's eye, or create a work of art that has impact. An exciting use of color always captures my eye, and apparently the eyes of this year's jurors as well. In the next pairing of works, both oil paintings, Mayhew and Murtha blasted their canvases with brilliance and subtlety at the same time. In Mayhew's Blue Sunrise, his little blue heron occupies waters colored by the emerging brilliance of the dawn's first, rich, warm hues (as noted in his text accompanying the catalog image describing his before dawn positioning in the field to capture en plein air, the 'magical colors of the morning'). Though that emerging brilliance is nicely identified in his reflective water, there is a very subtle quality to his depiction of bird and reeds that made for an overall feeling of calm awakening. 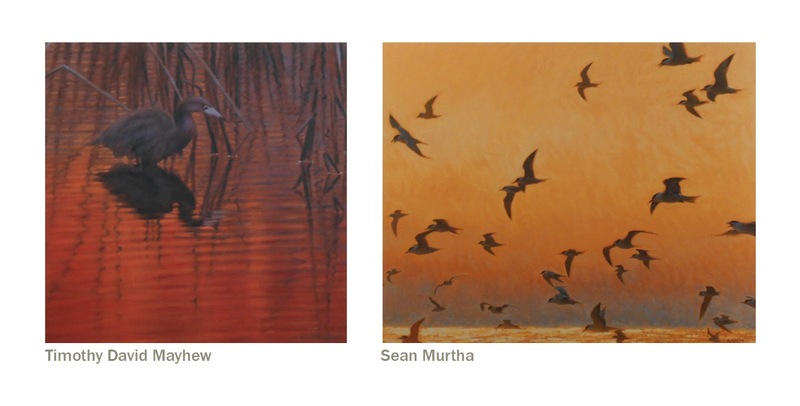 Sean Murtha chose to depict the opposite time of day in his Evening Flight with its end-of-day golden tones that brilliantly radiate the day's last warmth and act as a perfect backdrop to the muted purples and gray-blues of the homeward bound common terns. Color, used as these two multi-talented and multi-time-included artists in previous editions of Birds in Art have demonstrated, can create a work of art that will definitely catch a viewer's eye and draw them into the story created and thereby make the kind of connection with that viewer that might result in a sale, or in the case of these two specific works, result in their inclusion in a most respected and not-easy-to-make-the-cut jury competition. 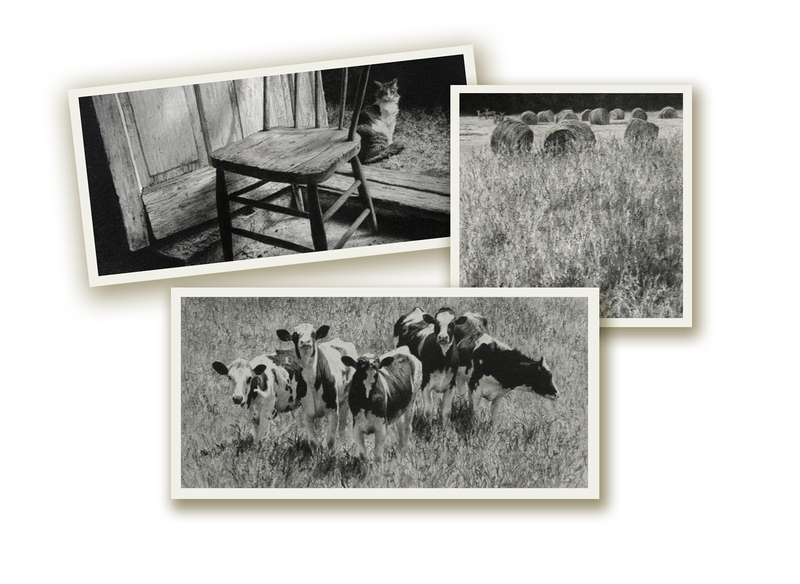 The next pair of works represent the use of a unique medium to its best advantage. 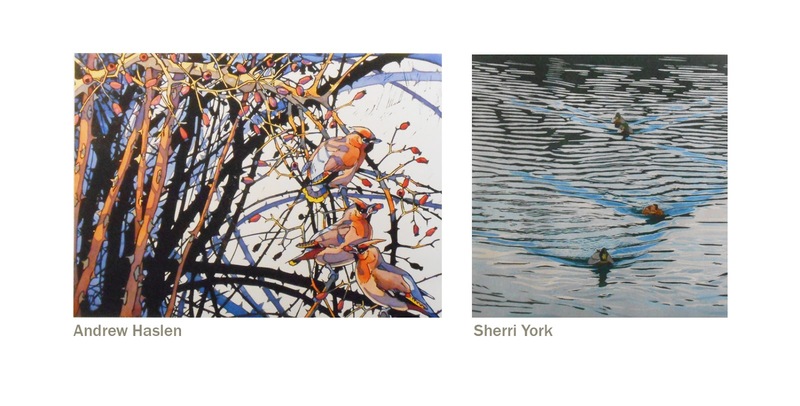 The two artists represented, England's Andrew Haslen (in his seventh inclusion in Birds in Art) and Sherri York (celebrating her ninth time as a Birds in Art artist) made use of the medium of linocut, but in their own, unique and personal way. Haslen's Waxwings added touches of watercolor to the base of the linocut to enhance the printed structure and add a bit of color pop. I really enjoyed the very abstracted quality of his manipulation of the print block, the sinuous movement of the branches contrasted by the sharded, broken-up stain glass-like appearance of the birds contours and their interesting placement in the overall composition; the repetition of the warmer tones throughout and across the entire composition really helped to balance all the elements into perfect harmony. York's mallards in Mooch Brigade offered a somewhat subtler compositional aspect in the more monotone coloring of her work, yet still offered some wonderful movement to the overall design in the way that the water ripples fan out from the swimming ducks and form a nice horizontal flow that runs counter to the forward and downward vertical movement of the main subjects. Working within a square 'canvas' (her piece being 18" square) added its own set of possible problems as the square format is not always conducive to devising a pleasing composition, but in this case, well played. It always pleases me to see the inclusion of monochromatic, basically black and white works each year and this exhibition contained quite a few that equaled every color work in integrity, artistic creativity, and competence and mastery of medium. I've spotlight just three of those below. 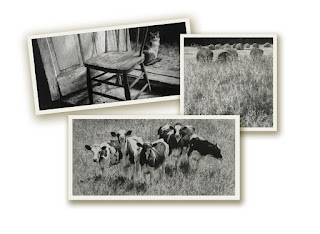 For the third consecutive year, T. Allen Lawson had a wonderful work make this year's cut. His Penultimate Perch, combining graphite and carbon pencil as well as charcoal on a handmade paper base, produced a very engaging work. Abstract in construction and spare in execution, his crow occupies a very unique position and viewpoint. I often talk about how utilizing a unique or unexpected viewpoint can turn an average subject or idea into something with a bit more pizazz and help to give that work a higher advantage in catching someone's eye (in this case, the eyes of a jury), and Lawson's crow certainly does that. He even mentioned in his accompanying text in the catalog about his thought that the perspective of looking up at the bird, while sketching it in the field, was something he had not experienced before. 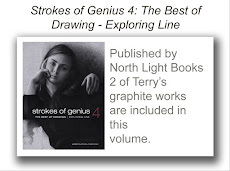 It is that sort of thinking, keying into a moment that offers something unexpected or never experienced or seeing something in a totally different light than usual, that offers an artist the opportunity to pursue that idea in the studio. I am, naturally, drawn toward works in graphite and Ryan Jacque's house sparrows in The Assertive One grabbed my attention, first in the catalog, and then in person in the museum from across the gallery floor. It's another of the small works (just 10" square) that seem to just sparkle amid all their larger and sometimes more dramatic cousins in the context of large exhibitions like Birds in Art, yet stand strongly on their own merits. 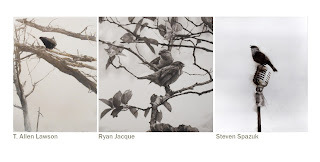 The overall compositional integrity of Jacque's drawing was the first thing I noted, then the beautiful and meticulous rendering of the birds and the leaves , followed by the soft ethereal, almost vaporous quality of the depiction of clouds. And again, it is tough to compose within the square but this small gem proves the point that if you know what you are doing, it's a breeze. The last work in this trio is by a 'first timer', Canadian, Steven Spazuk, whose inclusion in Birds in Art this year marks his debut in Wausau. Smoke-filled Vocalize attracted my eye first, because of its soft, wispy immediacy in delineation, but was followed by a smile and raised eye brows when discovered it was done with soot on a gessoed panel. Talk about your interesting and unique medium! I also found the simplicity of the work very appealing with a total focus on its subject, crisp details where needed and softer, flourishes where not. 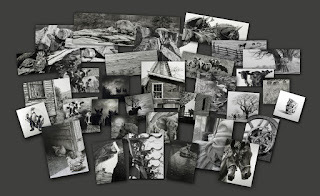 Having little more than the ability to depict light and shadow, variation in texture, and tonal variation in shades of black, white and gray, the monochromatic artist must find what is unique about using a black and white medium - choosing an interesting subject, skewing a viewpoint, introducing humor or solace or deep emotion, carefully juxtaposing the positive and negative relationships of the composition - in order to attract attention and demand a viewer to pause and look and enter that work and find appreciation in that artist's interpretation and the three artists spotlighted here, have achieved those goals with individual style. Having recently, within the last four or five years, begun to see the possibilities of incorporating the human form in some of my own work, I now find myself drawn into works that mix both the natural world and its creatures and the two footed, upright walking variety that drive cars and stand before easels. The two works featured below mixed those subjects nicely in my eye. Mike Budden's The Lunch Crowd struck a very close chord within me as it was an idea, the likes of which, I have tossed around a number of times over the last few years. Very appealing in structure, the composition not only was executed with technical proficiency but really sang as perfectly balanced in all its individual elements - lovely movement and interesting posing of its human population as well as its winged subjects, nice angular movement across the horizontal picture plain, and pleasing choices in color use and rendition. Canadian, Rose Tanner's The Birders, though small at only 11" x 14" and soft in overall tonal value and color, grabbed me immediately for its obvious humorous aspect, but beyond that, I very much enjoyed the overall composition, again very akin to the kinds of designs I like to devise, as well as her lovely brush work. We humans share this earth with those in the natural kingdom, why not show the human/natural world connection in ways that are out of the ordinary or that focus upon the mundane? Seeing situations and events and occurrences from unusual vantage points can really catch a viewer off guard and make them stop and engage. In a follow up to the last pair of works featured, here are two more in which the natural world has been juxtaposed with the man made only leaving out the actual man! Another compositional idea I enjoy coming up with, these two works showcased birds in relation to the evidence of humans. 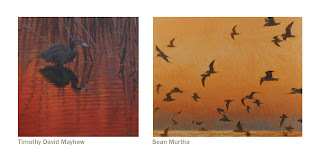 Scot Weir, with his fourth inclusion in Birds in Art, brushed a fine, interesting, large work (30 x 40"). Colorful in design, rich in texture, Rulers of the Roost added in a note of humor as the rooster inspects the old Harley and encouraged the viewer to find the story behind the image, as all appealing works of art should. Rod Lawrence in One of Three, retold a story of an experience he enjoyed while on a fishing trip in Florida. Sometimes the best art works come from the retelling of experiences or stories that artists themselves have lived. I was also drawn into this particular painting, once again, because its construction of composition is very much one I would have drawn out myself. I love the way the strong verticals are countered by the stretch of the horizontal in the gesture of the sitting pelican - the ups and the downs of compositional elements are what help to create balance and viewing pleasure. 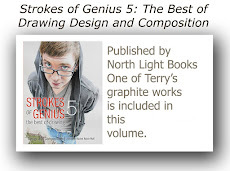 These next two works may seem like a strange coupling, but I found the aspects of humor and/or strong color and intense graphic design qualities of both to be very complimentary. In Mark Eberhard's Two Ducks on a Pond, his 16th inclusion in Birds in Art, he stepped aside from his usual entry of a flat, two dimensional painting with this wonderful sculpture. Right off, I sensed more going on here than simply a funny, well done construction as I saw, within the geometric forms and flatly rendered paint applications with accompanying graphic notes, a nod and a wink toward another well known artist, Charlie Harper (Google him and see what I mean!). I knew Mark was a friend of Charlie's and the 'connection' was confirmed after my return from the opening weekend via email confirmation of my initial thoughts. In any event, standing alone as a very appealing three dimensional work, Two Ducks on a Pond obviously caught the jurors eyes for its very strong graphic depiction, nicely arranged individual elements and humorous aspects. Another first timer, Michael Dickter in his work The Beauty of One,seemed to embody many of the attributes I saw in Eberhard's piece, but in two dimensions rather than three. The bright, bold colors were reminiscent of what I sensed in the ducks on the pond and there was a very distinct graphic quality to Dickter's oil painting that also mirrored that same quality in Eberhard's. I liked the uncertain, yet well designed flow of the birds through the canvas, all nicely balanced against the negative space of the flat background. The added touches of drifting brush work brought in another perception of movement across the otherwise static poses of the birds. 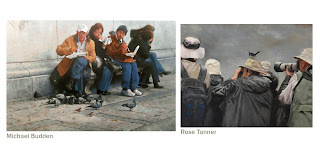 The final pairing, below, of two seemingly unconnected works, did have a connection, in my mind at least! In John Pitcher's 17th inclusion in this Internationally respected exhibition, I wanted to show both the work and its frame, as the two make for one, unique presentation. 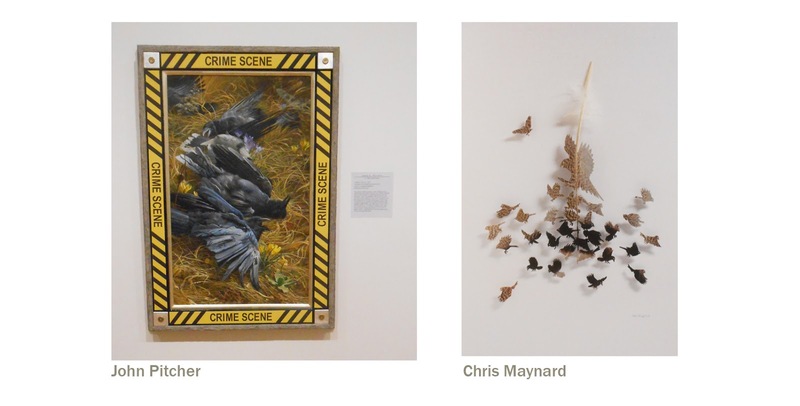 In A Murder of Crows, John set up a virtual crime scene, police tape on the frame and all, to tell a story above that depicted, relating to, as he put it in his text for the image in the catalog, "a reminder of humanity's crimes against nature." Telling stories in art certainly can engage a viewer, and sometimes the story that forms in a viewer's mind is not necessarily the one the artist had in mind, but that is the beauty of telling stories - each person takes away from the story what they wish and all stories are valid. Washington State resident, Chris Maynard cut to the chase in his story telling by carefully and skillfully cutting up a turkey tail feather. In his fourth inclusion in Birds in Art, Maynard unfolded a tale, in Cooper Stooper, of the "natural cycle of life and death" as he wrote in his catalog text. The cooper's hawk emerges out of the feather to pursue its chosen prey. Again, as with soot on gessoed board earlier discussed, an unexpected medium of creative transport is spotlighted in Maynard's sliced feather and it has every bit as much power as any oil painting shown alongside it. A final few words about sculpture and some of my favorites. 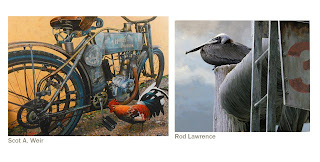 This year's named and honored Master Wildlife Artist, Don Rambadt, never ceases to amaze and mesmerize with his ability to construct three dimensional bodies with such movement and life, out of nothing more than scraps of and cut pieces of metal. I've admired Don's work for many years and never tire of his imaginative way of working the theme of birds into his constructions. 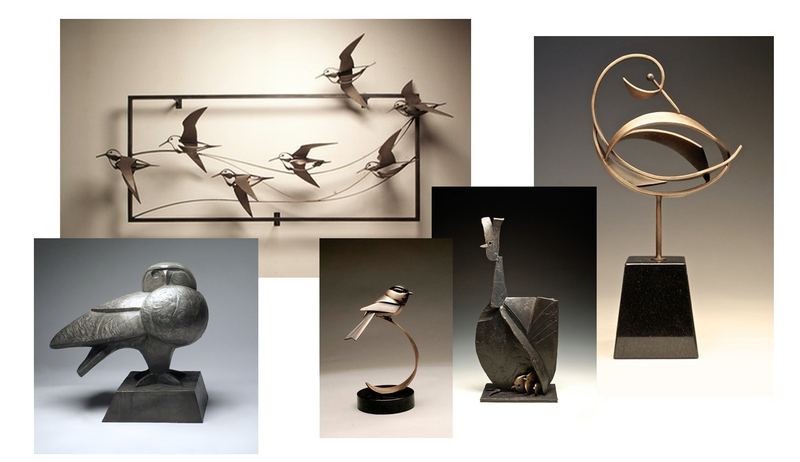 In few, simple geometric shapes and twists of thin metal components, he manages to capture the simple essence and elegance of bird forms whether they be moving through the air or standing still or preening or just about to take flight, every work shows he is truly a Master of his medium. I hope you enjoyed this quick tour of some of my favorite works from this year's exhibition and again, these are just highlights of the fine works that made the cut for this iteration of one of the annual events most looked forward to by those of us who see the characters and creatures of the natural world as our touchstones for subject matter. 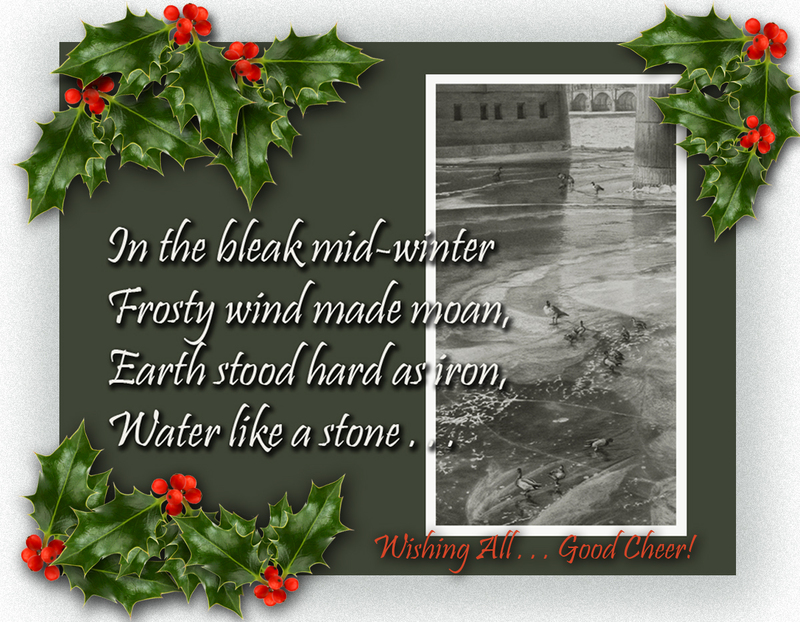 The exhibition hangs at the Woodson Art Museum in Wausau, Wisconsin through the end of November. 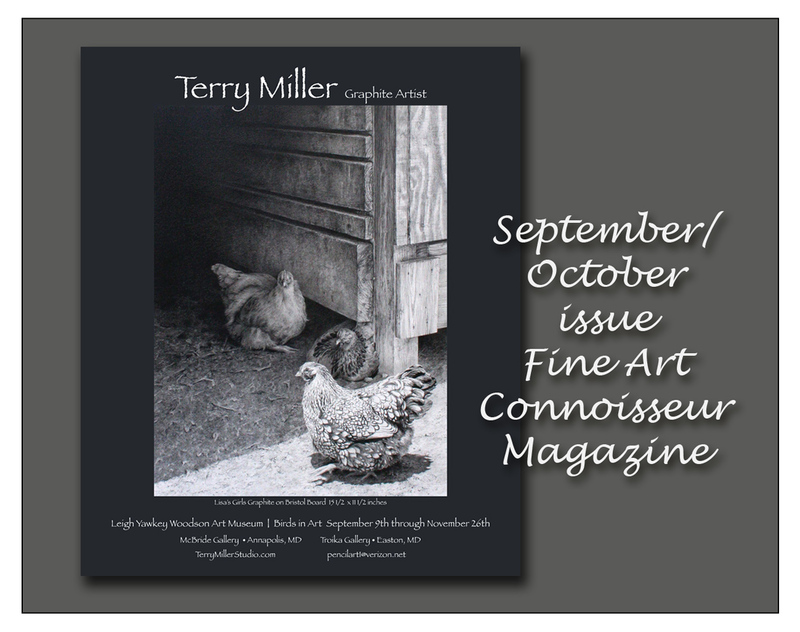 A package arrived on my doorstep yesterday containing several copies of the September/October issue of Fine Art Connoisseur magazine. 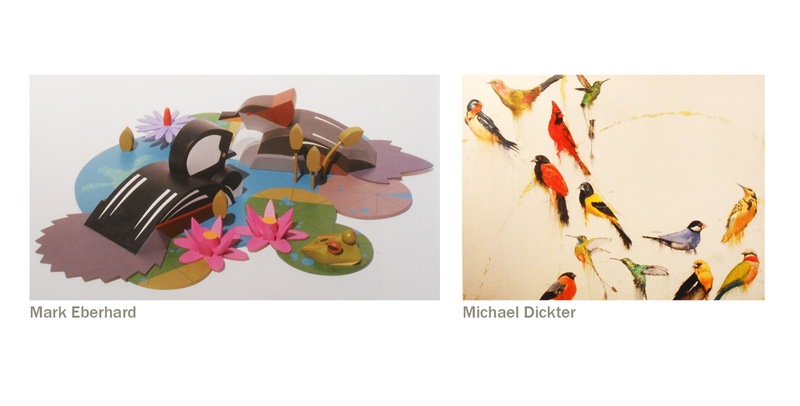 Contained within its pages was "Lisa's Girls:", which is my work to be included in this year's edition of Birds in Art at The Woodson Art Museum. 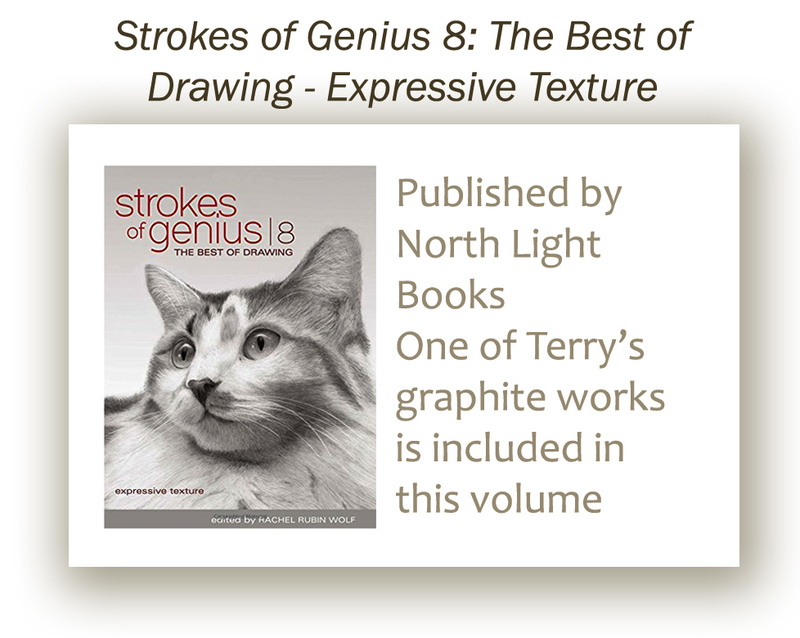 The ad was the result of a work of mine being honored, last fall, with the Editor's Choice Award (a full-page spread) from FAC during the opening of the Society of Animal Artists 2016 members' annual in Houston. 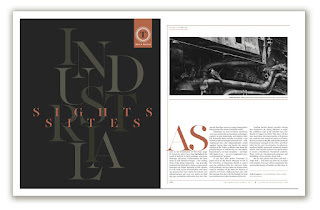 Needless to say, it is exciting to have one of my works spotlighted so in such a quality publication. 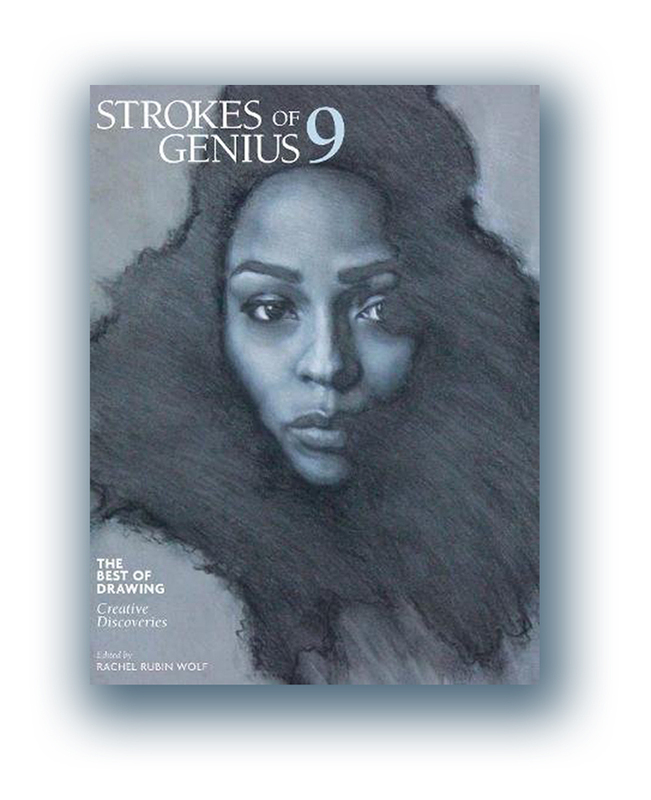 My thanks to the editor, my liaison with the magazine, and their graphic designer for making this happen. I'm off to The Woodson Art Museum later this week for the opening weekend festivities for the 2017 edition of Birds in Art. I'll be in the Richmond, Virginia area in late October (the 28th) to give a one day workshop on Composition at artist friend, Robert Caldwell's Visual Arts Studio. Registration for the workshop is now open at this link. I expect it will fill up fast so there may be a wait list for a possible second offering.